Transfer from your hotel in Lima to the bus station. Travel by bus from Lima to Huaraz (Item 13:00 hrs / 8 Hrs. Travel). Welcome and transfer to your hotel in Huaraz. Huaylas Tour and visit to the Lake Llanganuco. Overnight in selected hotel in Huaraz. Excursion to the Temple of Chavin. Visit Cahuish Tunnel, Laguna Querococha and various towns. Huaraz City tour and visit the Baths of Monterrey. Travel by bus from Huaraz to Lima (Afternoon from 13:00 hrs to 21:00 hrs). City Tour and visit the Baths of Monterrey. 3 Nights at selected hotel in Huaraz includes continental breakfast or buffet. 1 Transfer to all tourist attractions to visit. 1 Transfer from the Hotel in Lima to the Terminal and round trip. Tickets to all tourist attractions to visit. Description of the tour 4 days and 3 nights: Huaraza - Laguna Llanganuco, Chavin de Huantar. Travel by bus from Lima to Huaraz.. At 13:00 hrs, we will transfer from your hotel in Lima to the bus station, to board the bus to the city of Huaraz, the trip takes 8 hours. On arrival at the city of Huaraz, our staff will welcome you and drive you to your hotel to rest. Tour to the Callejon de Huaylas and Lake Llanganuco. Breakfast at the hotel at 09:30 hours, will start the tour to the Callejon de Huaylas, through the Andean villages of Carhuaz (tasting natural fruit ice cream and liquor), Tineo, Mancos, Yungay (Campo Santo de Yungay), and finally up to the Huascaran National Park. Visit the famous lakes of Llanganuco (Chinacocha and Orcocha), where you can go horseback riding or boating, do a little walk around these two lakes contemplating the majesty of the snowcapped Huascaran Yanapaccha, Paracas and Huandoy, plus the flora and wildlife surrounding these gaps.Here villagers expended región. Then we will visit the city of Caraz (lunch), there you will visit small dairy factories and other products of the region as blancmange, fruit and ice cream liqueur, honey , jelly, cheese, butter, pork leg ham, specialty breads, etc..In the afternoon we return to Huaraz, spend the night in the hotel. (Photo: Lake Llanganuco). 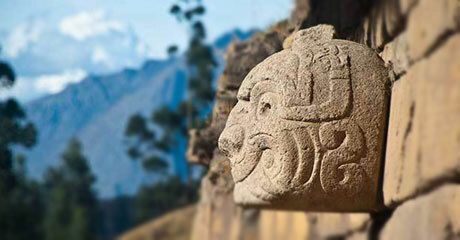 Tour the Temple of Chavin. Early in the morning, we will have an excursion to the Ceremonial Center more representative of the High Culture of Peru, about 3,000 years old. Along the way you will know the people of the Callejón de Huaylas Valley Conchucos, pass by Recuay Ticapampa and Cátac, reaching Querococha Lagoon. The tour continues its journey and this time will pass through the impressive tunnel Cahuish (4 550 m and 480 m in length). Then descend to the river valley to reach Mosna Chavin, where we visit the archaeological complex which consists of a set of stone buildings of truncated pyramid shape, with overlapping platforms and sunken plazas linked by staircases. The buildings have complicated interiors design galleries, one of them being in the "Lanzón" monolith of 4.50 meters, which represents the main deity of Chavin. "In the afternoon we return to Huaraz, spend the night in the hotel. Photo: Temple of "Chavin"). Huaraz City Tour and travel back to Lima. Breakfast at the hotel, then at 09:30 hrs, we will start the tour of the city of Huaraz and its surroundings, visit the Plaza de Armas, Ancash Archaeological Museum (Park lytic America's largest), Church of M. de la Soledad, Jr Jose Olaya (typical street of Huaraz), the viewpoint of Huaraz and the thermal baths of Monterrey. In the afternoon aboard the bus to take us back to Lima, depart at 13.00 hrs and arrive in Lima averaging 9.00pm, our staff will be waiting for you and drive you to your hotel. (Photo:Cordillera Blanca and Huascaran Nevado).